The question of how to read Marx has bothered many interpreters throughout the centuries. Every few years a couple of volumes are published that hand us a new thread of Ariadne out of the maze of Marx’ cryptic and suggestive prose. One should however not forget that Theseus left Ariadne to die on the island of Naxos shortly after their escape. He used her thread as long as she suited him, but immediately dumped her when more promising horizons appeared. Likewise, the continuous repetition of books claiming to have found the decisive interpretive key to Marx’ works shows just how quickly any single line of interpretation is abandoned. Sandro Mezzadra’s In The Marxian Workshops shows another escape: the refusal to look for a magical interpretive thread and recognize Marx’ writings for what they are: an insuperable maze. The starting thesis for this book is that the Marxist tradition had given a misleading picture of Marx’ philosophical style. His thought is usually represented as a systematic whole based on a set of scientific breakthroughs. This system is subsequently supposed to express itself uniformly and consistently in the multitude of Marx’ writings. Mezzadra criticizes this assumption on two accounts: it does not conform to Marx’ own writing habits and misjudges the preconditions for the validity of Marxist theorizing today. Mezzadra starts his book with a quote from one of Marx’ letters to his daughter Laura: “You would be quite mistaken in fancying that I am ‘fond’ of books […] I am a machine condemned to devour them and, then, throw them, in a changed form, on the dunghill of history” (1). According to Mezzadra, Marx was not a systematic scientist who moved from premises and discoveries to general conclusions by the power of deduction. He was, in reality, a reading-machine that extricated concepts from diverse readings and transformed them into experimental tools for social critique. He ‘devoured’ texts from sources as dissimilar as German idealist philosophy, Scottish Enlightenment economics, statistics about the Russian economy, etc., to confront them with whatever problems he encountered in the capitalist form of life. Instead of imagining Marx’s thought as one large edifice with each concept in its rightful place, Mezzadra regards his writings as a multitude of unfinished ‘cantieri’. The translator renders this as ‘workshops’, but a more faithful translation is ‘construction sites’. With every text, Marx started building his system anew, each time starting from a different baseline and having a different outcome in mind. Mostly, Marx abandoned his projects prematurely. It would hence be misleading to look for an overall ‘philosophy of Marx’. There are only try-outs, experiments, and a lot of unfinished manuscripts left to the gnawing criticism of the mice. Mezzadra, secondly, argues that the systematic picture of Marx’ thought has served the functions of describing capitalism sociologically and justifying political action in the 20th century. The success of both however depends on a very specific social and political context that is now outdated. Marx’ Capital – usually taken as the main text of Marxist doctrine – responded to the labour conditions specific to large-scale industry in 19th-century Britain. In that context, it made sense to describe capitalist development as a seemingly self-propelling logic, and to identify homogenous class subjects as the key agents in social struggle. Large-scale industry tended to reduce all individuals equally to the abstract social roles of providers of labour power or holders of capital. Other distinctions, like race or gender, were only of secondary importance. Taking the homogenous and unitary subject of the working class as a given, it was useful for communist partisans to construct Leninist vanguard parties to combat capitalism. Since workers were reduced, under 19th-century capitalism, into brainless appendages to a system of top-down command, the most efficacious way to politically organize workers was to mimic this top-down structure and use it against capitalist command. Mezzadra questions whether such a strategy could still be effective today. Capitalism has considerably changed since the days of Marx, so there is no reason to assume that the sociological descriptions he gave and the political advice that derived from his descriptions are still up to date. Marx could not have known that today’s manifestation of capitalism entails the proliferation of divides among intersectional lines (working class, gender, race, sexual orientation, etc. ); he could not have foreseen the co-existence of large-scale industry in developing countries with networks of immaterial labour in the global North; he could not have foretold the opportunities for autonomous self-organization among workers possible today. Mezzadra thereby returns to a valuable insight from workerist philosophy of science. Any scientific concept is a real abstraction extracted from concrete empirical settings. It requires this underlying context for its validity. Once the circumstances that gave birth to the concept change, the scientific idea itself has to be rejected as well. Otherwise it becomes an ideological remnant of past discoveries. When Marx, for instance, wrote about ‘the proletariat’, he was referring to an actually existing homogenous crowd of workers present in British large-scale factories. This was a clear and circumscribed group to which one could ascribe a single set of grievances, political tactics, and aspirations. Once the conditions of the global working classes change dramatically, a word like ‘the proletariat’ obscures more than it illuminates. It covers up the multifariousness of experiences lived by impoverished labourers in rural France, children working in Bangladeshi sweatshops, cleaning personnel in Japanese hotels, or coerced natives in South-American drug trafficking. Under what conditions could these multitudes be gathered under the single signifier of ‘proletariat’? For this reason, Mezzadra proposes to repeat Marx’ ‘construction site’-approach to philosophizing. 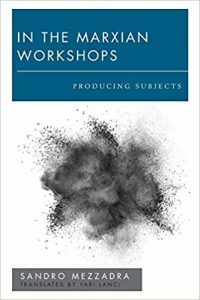 Instead of presenting a uniform picture of Marx’ thought, In the Marxian Workshops uses Marx’ experimental style to grapple with the changed circumstances of 21st-century capitalism. Mezzadra wants to put Marx’ tools to a new use by confronting them with a thorny issue in contemporary philosophy, the production of subjectivity. Human subjects not only are produced by the circumstances they find themselves in, but they also produce themselves through autonomous acts of self-constitution. Factory workers, for instance, show that they are more than mere cogs in the economic machinery when they join a strike and demands a wage surplus above the equilibrium labour price. Mezzadra hence proposes an antagonistic theory of subjectivity: the subject is the tension between passive determinateness and active self-determination. He uses this insight to, for instance, describe the subjectivity of workers as a force-field between living labour and abstract labour power. To survive, people have to sell portions of their time to money-holders in exchange for a wage. They put their abstract labour power for sale and give it to the highest bidder, who can subsequently choose how to mobilize this abstract force. This labour power is hence abstract because the human body is stripped of its specificity and transformed into a mere quantity of labour that can be put to use according to the laws of capital. Human bodies are however always capable of more than what capital can turn into surplus value. This excess of ‘living labour’ functions as a lynchpin for struggle against capital’s attempts at fully determining human bodies. The subjectivity of labour is ultimately the tension between the abstract forces conditioning it and the living forces combatting those external influences. The largest part of Mezzadra’s book is devoted to confronting the antagonistic theory of subjectivity with some key writings and concepts from Marx; the critique of religion, primitive accumulation, commodity fetishism. Among these divergent topics, I would like to mention just one interesting conclusion Mezzadra draws from the confrontation between Marx and the antagonistic concept of subjectivity. When discussing the nature of ‘class’ in the eighth chapter, Mezzada notes that there it functions simultaneously as a sociological concept describing a particular group of people of a certain socio-economic status, and as a political category responsible for mobilizing people for a specific partisan project. In classical Marxist writings, this has been theorized through the distinction between ‘class in itself’ and ‘class for itself’. The working class is allegedly a given in the capitalist mode of production. It supposedly only needs a vanguard party to inform it of its exploitation to acquire ‘class consciousness’. The vanguard party is supposedly responsible for mediating the move from class in itself to class for itself by raising class consciousness among workers. This approach only replaces one form of external determination (the capitalist mode of production) for another (the vanguard party infusing workers with class consciousness). It forgets the active dimension of working class subjectivity. According to Mezzadra, class subjects actively produce themselves through their struggles with capitalism. From this angle, ‘class’ is not an already given social group that needs to be made aware of its existence. It is a ‘compass of orientation’ (74), a perspective of practical daily struggles over mundane issues like wages or working hours, through which a group constitutes itself as a ‘class’. This alternative concept of class has the advantage of not only diversifying the opportunities for class struggles beyond the projects of political parties or trade unions, but also of including new identities that are frequently posited as rivals to class-based identities (gender, race, sexual orientation, etc.). Why would, for instance, women or African-Americans not conduct working class politics in their struggle for equal wages? It is by disclosing construction sites like this that Mezzadra shows what edifices are still possible for Marxist politics. As a life-long experimental scientist I offer the opinion that apparently the author (I have not read this book) and the reviewer have a completely erroneous understanding of the philosophy of science, by which I mean the practice of science. Apparently, and very ironically, they have absorbed the conventional, capitalist explanation of the philosophy of science and they have rejected the alternative Marxist philosophy of science. The motive force in science is not the hypotheses proposed but the observations that are made. The following quotes from the review are completely wrong. The conditions that Isaac Newton worked on are now archaic. Do we now need therefore, to discard Newton’s rules that describe motion. That is clearly the implication in the review. Not a single scientist would support this notion. Millions of engineers use Newton’s rules of motion daily to build buildings, bridges, vehicles and etc. What scientists do say is that Albert Einstein has extended Newton’s rules of motion, for both greater and smaller dimensions of space and time. Einstein says that what he showed is that Newton’s view that empty space is a material ‘thing’ is incorrect. There is no such thing as empty space. Space is filled with energy and objects, which are the same stuff. The reviewer does raise and confuse an important problem in the philosophy of science because he refuses to see Marx as a scientist, in the sense that he was student of reality and was attempting to understand reality by close and careful observation. By definition, every philosophical materialist is a scientist. A scientist is not a white man in a white coat in a white laboratory. Scientists are those people who wish to understand the world around us and ourselves in that world. Scientists do this primarily by close observation of the real world, paying particular attention to avoid making known errors. Scientific practice is essentially a social activity, because only in this way are grave errors avoided and more importantly because all human activity is social activity. Scientific truth is ultimately determined by social practice, not by individual judgement. The reviewers odd notion that we should discard scientific truth as reality evolves, does raise an important rarely discussed problem in philosophy. To indicate how quickly fundamental views can change I will tell that when I was a science student I was taught that in physics molecules, atoms and electrons were stable unchanging objects. (Obviously, radioactvity was already well-known.) Nowadays, it is a commonplace that evolution, change, mutation, development occurs in all three great domains of science; the inanimate physical universe, the biological universe, and universe of human society. But two important observations can be made about these commonplaces. Firstly, the dimensions of time and space are peculiar to each domain or even within each domain. This is crucial to an understanding. Secondly, it is a common philosophical mistake to ‘borrow’ the mechanisms of evolution, change, mutation, development from one of the great domains of reality and use it in another domain. This is always wrong [example; memes]. The mechanisms in concrete detail are quite different in the different domains. Finally, I must add before someone causes further confusion, that it is well-established that all the rules of the physical universe self-evidently (for Marxists anyway) apply to the biological universe. Similarly, all the rules of the physical and biological universe apply to the universe of human society. However, conversely, it must be emphasised that as the biological universe evolved it did so by evolving quite novel rules applicable to biology but not to the physical universe. Similarly, when human societies evolved they evolved novel rules again which are not observed in the physical or biological domains. “When Marx…wrote about ‘the proletariat’…,” what engaged his greatest ire was said “proletariat’s” subjection to dehumanising exploitation which essentially foreclosed “the proletarians'” self-developmental possibilities. Of course, and in proper diachronic fashion, has the term, “proletariat”–let alone, “communism”–provoked polemics as to their meaning, efficacy, datedness, etc.